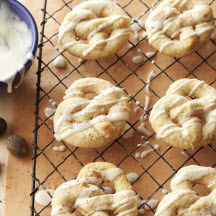 For a flavorful old-world cookie, whip up a few batches of this pretzel-shape Scandinavian favorite. Eggnog-flavor icing adds extra sweetness, and freshly grated nutmeg gives the cookies a touch of spice. For Cookies: In a large bowl beat butter with an electric mixer on medium to high speed for 30 seconds. Beat in the sugar, scraping sides of bowl occasionally. Beat in baking powder, baking soda, the 1 teaspoon fresh nutmeg, salt, and, if desired, cardamom until combined. Beat in egg, vanilla, and rum extract until combined. Alternately add flour and eggnog, beating after each addition until combined. Divide dough in half. Wrap and chill for 1 to 2 hours or until dough is easy to handle. On a well-floured surface, roll half of the dough at a time into a 10x5-inch rectangle. Using a sharp knife, cut each rectangle crosswise into twenty 5x1/2-inch strips. Roll each strip into a 10-inch rope. On an ungreased cookie sheet, shape rope into a loop, crossing rope over itself about 1 1/2 inches from ends. Twist rope at crossing point. Lift ends over loop and the ungreased cookie sheet. Bake in the preheated oven about 5 minutes or until tops are very light brown. Transfer to a wire rack; cool completely. Drizzle cookies with Eggnog Icing. If desired, sprinkle with additional nutmeg. For Eggnog Icing: In a small bowl stir together powdered sugar, dairy eggnog, and rum extract until smooth. Stir in additional eggnog, 1/2 teaspoon at a time, to make an icing of drizzling consistency. To Store: Layer cookies between sheets of waxed paper in an airtight container; cover. Store in the refrigerator for up to 3 days or freeze up to 3 months. Nutritional Information Per Serving (1/40 of recipe): 104 kcal cal., 3g fat (2g sat. fat, 0g polyunsaturated fat, 1g monounsatured fat), 15mg chol., 77mg sodium, 18g carb., 0g fiber, 10g sugar, 1g protein.